Western North Carolina is a mecca for all things outdoors, and with the Great Smoky National Park, Pisgah National Forest, Joyce Kilmer National Forest, Appalachian Trail, Mountains to Sea Trail, and fours state parks all within an hour’s drive of Asheville, it is the ideal hub for hikers and backpackers of all levels. Each year, thousands of visitors and locals hike the trail systems, frequenting popular spots such as Graveyard Fields off of the Blue Ridge Parkway, Chimney Rock, Mount Mitchell, and Max Patch near the North Carolina-Tennessee state line. “I love the easy access to parks from Asheville – I know that I can get in my car, and within 45 minutes or less, I can choose from thousands of miles of trail depending on what I want to explore that day – waterfalls, views, wildlife, old growth forest – anything, really,” said Asheville resident Hallie Seay, an avid WNC hiker. As more tourists come to Asheville and more locals take to the trails for the annual fall foliage transition during the months of September and October, day hikers and backpackers have access to a diverse group of trails that have lots to offer based on distance and views, but all offer an explosive mix of rust and burnt orange hues, crisp breezes, and deep blue, cloudless skies. For the family, Sam Knob in the Shining Rock Wilderness offers a relatively short 2.2 mile hike that can be modified to add length, taking hikers through a wildflower meadow followed by a short climb to the summit of the autumn-hued, view-packed bald. When hikers are finished enjoying the view, they can return to the parking lot on the same trail, or add on additional mileage using the alternative return route via the Flat Laurel Creek trail at the base of Sam Knob, which then loops back to the parking lot. The trail is family and pet-friendly and is accessible to hikers of all ages and abilities. Another family and pet friendly trail for hikers of all ages and abilities is the flat, Pink Beds 5-mile loop hike in Pisgah National Forest. The popular trail features rushing creeks, beaver dams, mountain bogs, native wildflowers, views of the mountain fall foliage from a different point of view, and follows the headwaters of South Mills River, often on a boardwalk. For those looking for a challenging new hike, Montreat's Graybeard Trail (named for its namesake peak, the 'grandfather' of the Seven Sisters Ridge) offers a 9-mile out-and-back hike that follows a historic railroad path, and features streamside forest scenes, a small waterfall, and panoramic views from the high points above the Swannanoa Valley. The well marked trail has a total elevation gain of approximately 2,450 and is recommended for moderate to advanced hikers. 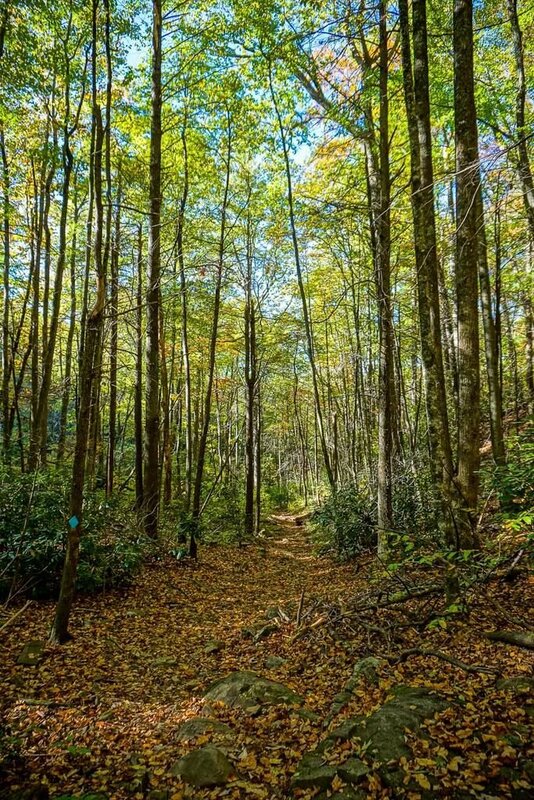 The trail also features a side trail to Walker's Knob (a 0.4 mi round-trip approximately 3 miles in to the Graybeard Trail), which offers sweeping southerly views, and can also be the final destination on the trail for 7 mile out-and-back hike. For optimal fall colors, take into consideration that elevations vary widely across western North Carolina, and peak foliage season will vary, as well. Fall leaf change begins in the highest-elevation mountain summits like Mount Mitchell in late September/early October, moving down to lower elevations later in the season.